Clybourne Park requires no choreographer, but it’s very much a dance show. Bruce Norris’ 2011 Pulitzer Prize winner is about the way Americans linguistically tap, jive and plie around what we really mean regarding race, falling back on euphemisms and dog whistles, jokes and ironies, claims of cultural heritage both bogus and legitimate. It’s an un-P.C. play that both critiques and revels in such incorrectness, inverting Lorraine Hansberry’s A Raisin in the Sun into a David Mamet polemic. 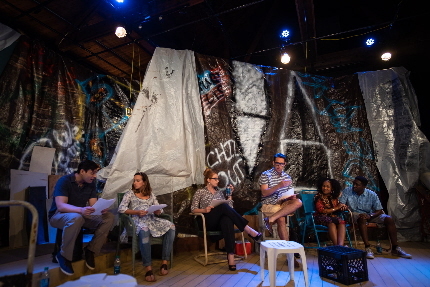 Produced competently, with flashes of brilliance, by New City Players at the Vanguard, Clybourne Park’s expose of the evolving presentation of white privilege over generations has lost some of its structural novelty, observational luster and ability to shock in the seven years since its regional premiere at the Caldwell. Put it another way, it feels quaintly pre-Trump, as even its most repellant characters have nothing on today’s deplorables. But Norris still exhibits a profound understanding of the relationship between skin color and place of residence, especially in the more delicately scripted first act. The play’s most memorable lines of dialogue—“You can’t live in a principal;” the history of America is the history of private property”—still resonate. Director Timothy Mark Davis approaches the first act, set in 1959, as a ‘50s TV parody of Midwestern middle-class malaise, a curious and not always satisfying choice. Ilana Isaacson, as housewife Bev, and John A. Dalton, as her husband Russ, have to overcome exaggerated makeup from Jessica Schulte, their personalities buried under an excess of eye shadow and a painted-on five o’clock shadow, respectively. Isaacson’s out-of-place, affected Minnesotan accent is likewise a distraction. It’s Bev and Russ’s last few days in their lily-white Chicago suburb, their unkempt house implying an imminent move. Cardboard boxes dot the floor, and various knickknacks lean sloppily on shelves, awaiting their final destinations. Russ would like nothing more than to sit back in his easy chair and enjoy a day off work, but visitors keep darkening their door: First, Jim (Johnny Contini), a gangly young priest straight out of Leave it to Beaver, who says things like “Holy Toledo!” and “Jiminy Christmas!”; and Karl (Daniel Gil), a racist emissary for the community Rotary club, who drags along his deaf and pregnant wife Betsy (Krystal Millie Valdes) like an appendage he’d just as soon remove. Karl is furious that the buyers of Russ and Bev’s house are “colored” folk, and he assumes that everyone else in the room will agree that they must reverse the purchase. A black family will besmirch the neighborhood’s cultural identity, he says; they’ll degrade property values. Sure, they can clean our houses and sell us our groceries, but there must be limits, yes? Stephenson embodies Francine as the show’s moral conscience, lingering forever in the background, silently absorbing cultural blow after cultural blow. In the show’s best performance, she is the face of deference and acquiescence necessary for survival in a WASP world; it isn’t until a verbal brawl breaks out in the living room that the person behind the chambermaid veneer reveals herself, and the contrast is bracing. Director Davis handles conflict exceptionally well. The overall pacing could use some more massaging—it can be feel alternately rushed and slowed, with a character’s trip to the kitchen to pour some iced tea, for instance, seeming to take about 10 stage minutes—but Davis is firmly in his element when Clybourne Park explodes. He stages these moments with overlapping dialogue and physical fisticuffs complete with a realistic tumble. Other casting and directing decisions are uneven; Gil, for instance, overplays Karl like a cartoon bigot, which is of a piece with this act’s more problematic sitcom tendencies, and the few examples of sign language he shares with Valdes are unconvincing. The second act is more acerbically comic but less substantial than the first, which better captured tensions surrounding race, from its most benign to malignant manifestations. This time, Jim Crow having been relegated to the dustbin of history, the opposing sides are more equal but still fundamentally separate. Both buyers and sellers are well-dressed, well-traveled cosmopolitans. But let them have a loaded chat about heritage and culture, and the knives come out. The resulting confrontation is raucous but stale. Like half the successful plays on Broadway in the past 15 years, it’s about civilized people descending into tribalism. The production touches the right nerves, though; Gil and Randle, in particular, excel at their primitive, race-baiting cockfight, and Stephenson delivers the evening’s most unforgettable putdown, one that’s unprintable even on the internet. Act 1 of New City Players’ Clybourne Park is an excellent standalone play in a production that needs improvement; Act 2 is a gimmicky and unfulfilling addition, excellently produced. These disparities speak to the reality that the misguided Caucasians in Norris’ play fail to grasp—that just about everything operates in shades of grey. Clybourne Park from New City Players runs through April 22 at The Vanguard, 1501 S. Andrews Ave., Fort Lauderdale. Tickets run $20-$35. Show times are 8 p.m. Thursdays to Saturdays and 4 p.m. Sundays. Call the box office at (954) 650-5938 or visit newcityplayers.org. To see a promotional trailer, click here. This entry was posted in Performances, Reviews and tagged Bruce Norris, Clybourne Park, Daniel Gil, Delisa Stephenson, Ilana Isaacson, John A. Dalton, Johnny Contini, Krystal Millie Valdes, New City Players, Roderick Randle, Timothy Mark Davis. Bookmark the permalink.